Daylilies appear in so many landscapes because they are so easy to grow. They are vigorous perennials that can survive in your garden for years with little or no care. They tolerate a wide range of soil and light conditions, and the flowers come in a variety of shapes and sizes. Many kinds bloom nearly all summer long. Daylilies belong to the genus Hemerocallis and are not true lilies. Their foliage grows in fans from the plant's base, eventually forming dense clumps. The long, grass-like foliage is quite attractive, even when the plants aren't in bloom. During the summer, they produce stems of trumpet-shaped flowers that are usually held well above the foliage. Hemerocallis may be planted anytime from late spring to early fall. They are hardy in zones 2 through 9. They perform best in full sun, but will also grow well in partial shade. They prefer a well-drained soil that is high in organic matter. Work compost into the soil to increase organic matter. Space plants 1 to 3 feet apart. They will require regular watering at first. 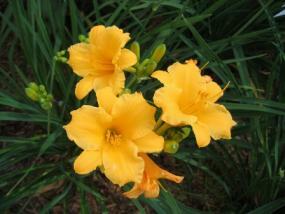 But once established, daylilies are quite drought tolerant. Mulch around your perennials with 3 inches of organic mulch to hold in moisture and discourage weeds. To keep your gardens looking tidy, you may deadhead your daylilies regularly, but it's not necessary. Cut back flower stems after all blooms are spent to remove seed pods. If the foliage starts to look shabby late in the summer, it's okay to trim it back to 4 to 6 inches. After several years, crowded clumps should be divided. Do this when the weather is cool-in spring or fall. Make divisions by digging up the entire plant and gently pulling the fans apart. Cut the foliage back to five or six inches. Place divisions back in the soiland water thoroughly after planting. In early spring, before growth starts, remove the dead foliage from the previous year's growth. 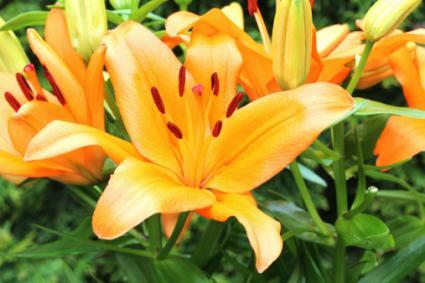 You may feed daylilies in the spring with compost. Insect or disease problems are rare. These tough plants can usually overcome any problems on their own. If aphids and thrips are feeding on the flower buds, control them with insecticidal soap or a repeated strong spray of water. Originally available only in shades of yellow and orange, today there is a rainbow of daylilies available in colors such as red, pink, and bi-colors. Flowers are funnel-shaped, ranging in size from 2 inches to 12 inches. Petals may be curled, ruffled, or spider-lily-like. Most daylilies bloom only once a season, but some are repeat bloomers, allowing you to enjoy their beautiful blooms from late spring well into autumn. Stella D'Oro is probably the most popular daylily ever. It is a compact plant with small, bright yellow flowers. After an initial flush of flowers, it flowers continuously throughout the season. Happy Returns, Little Grapette, and Eanie Weenie are repeat bloomers, producing a main flush of flowers and additional spikes later in the season. Rosy Returns has the flower power of 'Stella D'Oro and features large 4-inch blooms in vibrant rose with a deeper rose eye and yellow throat. It forms a neat, 16-inch clump. 'Rosy Returns' also makes an excellent container plant. Gentle Shepard has whitish ivory blooms. There are thousands of Hemerocallis cultivars available. Many new plants are introduced annually. Rare varieties can fetch hefty prices. But there are many beautiful cultivars available at reasonable rates. If possible, visit a local garden or nursery that features daylilies to see which varieties grow well in your area. Seeing them in bloom will also help you select the ones you like. Perennials such as Russian sage or ornamental grasses in the background. Combine them with bulbs or perennials that go dormant in the summer. *Mass them along paths or driveways. They are also edible, so you can serve your organic blossoms in salads. In fact, nearly all of the plant is edible and is high in protein and Vitamin C.
Hemerocallis species are perfect for tough garden situations. They are salt and drought tolerant. Plant them on steep hills to help prevent erosion; the root systems form a dense mat to stabilize soil.